Punching roofing tiles suspended in the air. 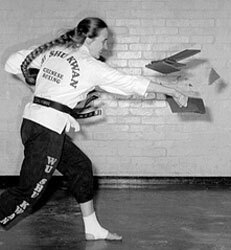 Demonstrating a devastating throw for self-defence. 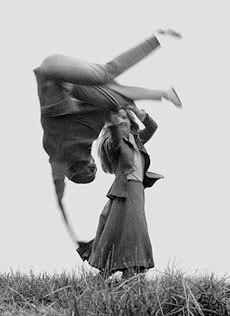 Practising high jumping kick in the park. 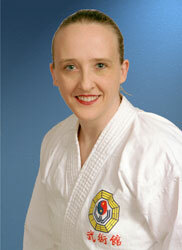 Trish is one of the highest-ranked martial artists in the world. 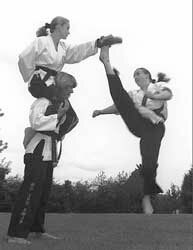 She has taught and conducted gradings regularly in many countries, including UK, USA, Australia, Canada, Barbados, Trinidad and Switzerland. Chopping a building block with her bare hand. 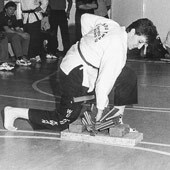 Kicking a piece of wood held by a group of helpers. 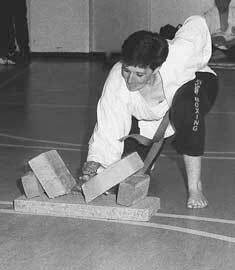 Punching a stack of roofing tiles.